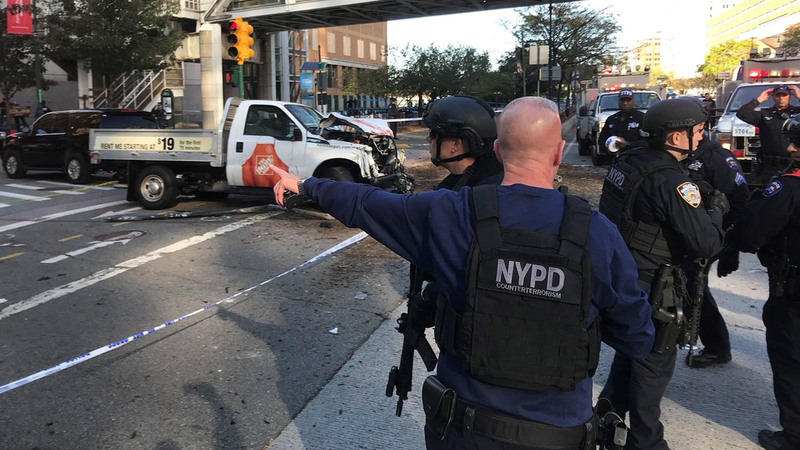 LOWER MANHATTAN, New York (WABC) -- A man in a rented pickup truck mowed down pedestrians and cyclists along a busy bike path in New York City Tuesday, killing at least eight and injuring 13 others in what the mayor called "a particularly cowardly act of terror." The driver was shot in the abdomen by police and taken into custody after jumping out of the truck with what turned out to be a fake gun in each hand and shouting "Allahu Akbar!" officials said. His condition was not immediately released. The incident happened just after 3 p.m. ET on the bike path that runs along the West Side Highway in Lower Manhattan. NYPD officials said a truck driven by a 29-year-old man entered the West Street pedestrian/bike path a few blocks north of Chambers Street. It proceeded to strike multiple people on the path. The driver barreled along the bike path for the equivalent of about 14 blocks, or around eight-tenths of a mile, before slamming into a small yellow school bus. The driver exited the vehicle displaying imitation firearms -- a pellet gun and a paintball gun -- and was shot by NYPD officers, investigators said. Video showed him running through the street, likely before he was stopped by NYPD. The video shows the driver moments after ramming down bicyclists with his pickup truck. The mayhem and the burst of police gunfire set off panic in the neighborhood and left the pavement strewn with mangled bicycles and bodies that were soon covered with sheets. The suspect is in custody. Multiple law enforcement officials tell ABC News that the suspect In custody is identified as 29-year-old Sayfullo Saipov. His drivers license shows an address in Tampa, Florida, but sources said he also a recent address in Paterson, New Jersey. The sources added that Saipov left a note saying he had done the attack on behalf of ISIS. One witness report is that the suspect yelled "Allah Akbar" after getting out of the vehicle, and that's what makes them believe it's terror-related. "I can confirm it was a Home Depot rental truck. We'll be cooperating with authorities in their investigation. At this point you'll need to speak with them for any additional information." Officials said this does not appear to be connected to any larger terror group or events. New York Gov. Andrew Cuomo said there is no ongoing threat in New York City, but New Yorkers should expect to see more security. The FBI is working with the NYPD in the investigation. In addition, any information to assist in this investigation can be called into either the FBI at 1-800-CALL-FBI or the NYPD's Crime Stoppers Hotline at 800-577-TIPS or for Spanish 1-888-57-PISTA (74782).